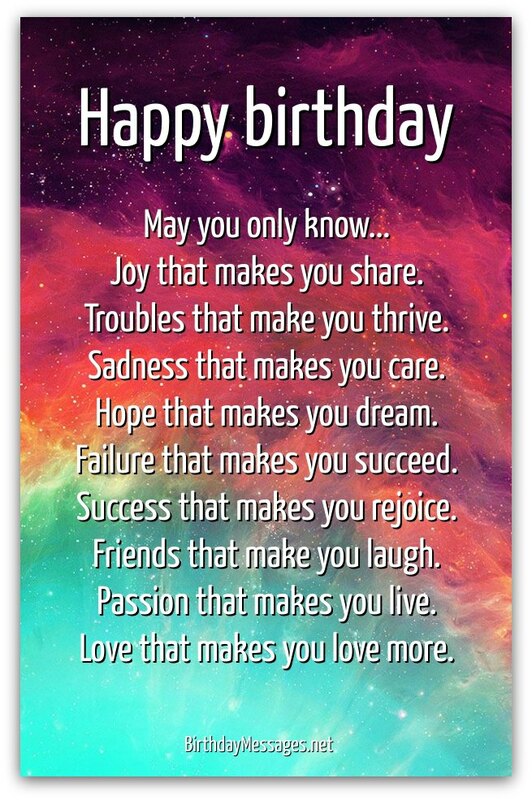 The right inspirational birthday poems have uplifting birthday messages that can actually transform the lives of the ones you love — just like the poems for birthdays on this page. What is the right type of inspirational poem? If your aim is to be a positive influence, choose inspirational poetry that can inspire your loved ones to become the best versions of themselves. Only you know what can make the ones you love better people, so only you can make the right poem choice . Not all inspirational poems are created equal. 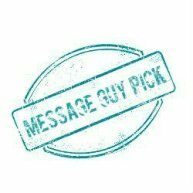 Sifting through all the options in this section to find the right poem for your loved one is easier with a little help from Message Guy. 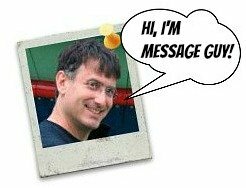 simply click here to see Message Guy Tip #96, a treasury of helpful hints on choosing the best inspirational poem for any birthday boy or girl. Interestingly enough, the name of this poem — The Vow — pretty much tells you the type of person who should receive it as a birthday message: anyone who needs to take a vow (by definition, a solemn promise, pledge or personal commitment) to better themselves, no matter what their circumstances are. Inspirational birthday poems like The Vow take this idea to a whole new level. When I read this poem, I can't help but hear the "The Little Engine That Could" nursery rhyme playing over and over in my head. That's because The Vow is all about moving forward...despite the uphill battle you may face ahead. The Vow cleverly and simultaneously mentions and dismisses every elephant in the room (every possible obstacle to happiness), showing just how determined the writer (and, vicariously, the readers of the poem) should be to live out their lives happily, in peace. 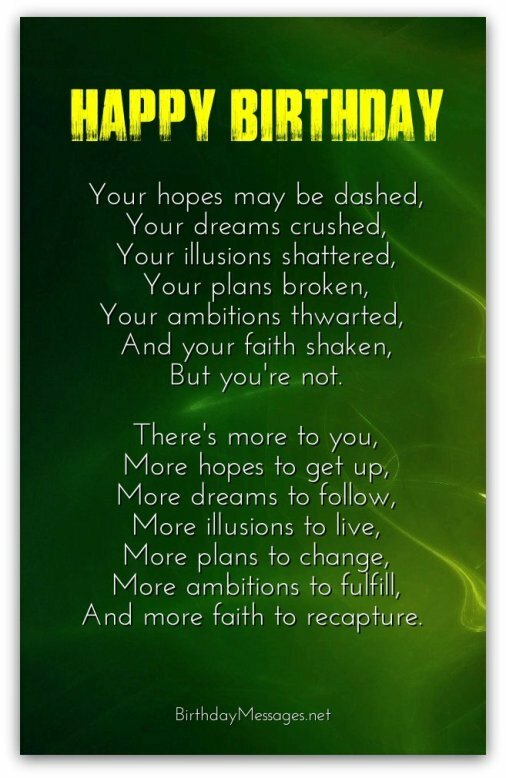 This poem is packed with inspirational birthday messages that are guaranteed to make a very positive, very significant impact. For a brighter day will come again. And stay my course within this race. For the dignity in simplicity. For like spring I'll get a new start. For someone else to heal. Until my viewpoint is clear. And, just for living, be glad. Joy that makes you share. Troubles that make you thrive. Sadness that makes you care. Hope that makes you dream. Failure that makes you succeed. Success that makes you rejoice. Friends that make you laugh. Passion that makes you live. Love that makes you love more. Where your heart can speak to you. My comfort zone had become a jail. So everything stayed the same. Still I yearned to be wild and free. And leave a trail of fear behind. With a passion some may call mad. For your heart knows what's right. The message of this inspirational poem — be a good person and take the high road — is simple but has profoundly meaningful ramifications. Although Before You by William Arthur Ward does not spell out the rewards of being a good person, the poem implies that listening, thinking, earning, investigating, waiting, forgiving, trying, saving and giving are preferable to just speaking, writing, spending, investing, criticizing, praying, quitting, retiring and dying, offering the reward of a life better lived — in other words, a more fulfilling, more joyous life. This is one of those inspirational birthday poems that would be ideal for birthday boys and girls who need a reality check, a message that reminds them about what really matters in life: the ones you love and others less fortunate than you. 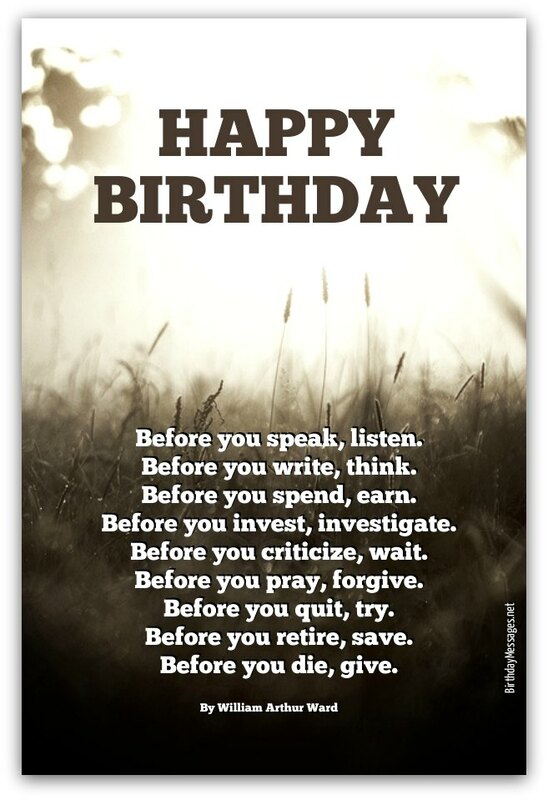 What a powerful, uplifting message to give your loved ones on their birthday. If you would like to add a personal birthday wish, here's a recommendation that should fit the poem: Before you fret that it’s your birthday again, celebrate! Have a happy, happy birthday! And more faith to recapture. Need to see more inspirational birthday poems? Taking chances is what makes life livable. That's the key message in one of Berton Braley's inspirational birthday poems, The Joy of Life. Cleverly, he keeps this message simple, easy to digest and impactful. Who can deny that the "game's in the playing"? Not too many people. Time and time again, life has shown me that it's far better to "do" something than "have" something. Inspirational birthday poems, like The Joy of Life, are best suited for birthday boys and girls who need a quick "pick me up" after a long-drawn-out letdown. This and other inspirational birthday poems by Berton Braley can truly inspire your loved ones to take another shot at their dreams. If you would like to add a birthday wish, you may want to use the following birthday message: May you rediscover the joy of life with every encounter, every experience and every person that comes your way. A cog in the mill. With nerve and with zest. And cast one last frown. And hold what you hold dear. Take all the joy you can. Between the last time lovers kissed. Or the wind that killed the flame. And time enough to try again.